After holding off a late Marlins rally on Sunday the Mets prevailed 7–6 and have now won eight straight games, their longest winning streak since 2010. The Mets now sit alone atop the NL East with a 10–3 record. 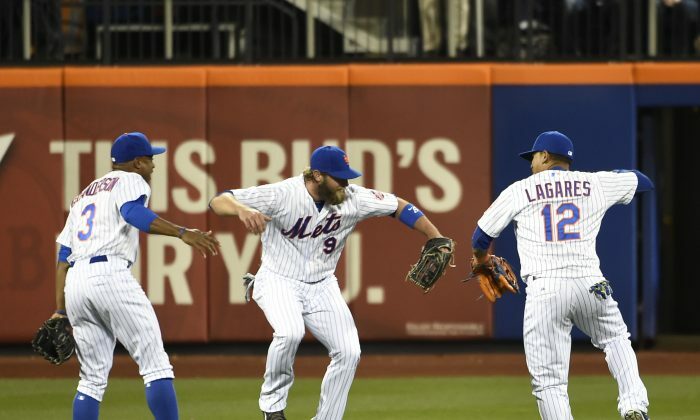 Are the Mets, who haven’t had a winning season since 2008, serious contenders? They sure look like it. After last year’s faulty 90-win prediction from GM Sandy Alderson (they fell short with 79), it’s about time, too. For those who need a refresher on how long it’s been, Alderson took over following the 2010 season. At the time, the team had attempted to rebuild through free agency/and or pilfering its minor league talent for veterans. As such players as Jason Bay, Johan Santana, Luis Castillo, Francisco Rodriguez, and Carlos Beltran were taking up a significant portion of the team’s payroll—which would soon need to be slashed per the owner’s needs. Alderson knew the team wasn’t good enough to go to the playoffs as it was and it would not work to rebuild through free agency—especially when you have to slash payroll. So he traded away what veterans he could for prospects, passed on large free agent signings, and even had to bite the bullet on letting Jose Reyes sign with NL East rival Miami. There were some unpopular days ahead for him being at the helm of a losing squad in the league’s biggest market, but the Mets were losing anyway, so why not build at the same time? Alderson’s first big deal was getting former first-round pick Zack Wheeler from San Francisco for a partial-season from Carlos Beltran. Considering he extracted more from the Giants for Beltran than the Royals (who Beltran came up with) got for a younger, less expensive Beltran seven years earlier, the trade was a major coup. In December 2012, Alderson dealt Cy Young winner R.A. Dickey, whose performance was the lone bright spot in an otherwise dreary season, to Toronto for Travis D’Arnaud and Noah Syndergaard, among others. The trade was not popular in New York, but dealing the 38-year-old at what would be his highest value, was the right move, as he didn’t fit into the team’s future plans. Meanwhile Alderson has complemented his club with veterans like Bartolo Colón and Curtis Granderson, cleared the way for Lucas Duda to excel at first base, and wisely signed Gold Glove center fielder Juan Lagares through 2020 to a low-risk, high reward extension. While his 90 win-prediction turned out to be 11 shy last year, it might have just been a year too early. No matter what you think of A-Rod and all his antics, he's surprising everyone with his play at the plate.